The Sasco Financial Year Planner is ideal if you prefer to plan on a July to June basis. Suitable for preparing budgets on a year-end basis, maintaining workflows, holidays and staffing levels. Includes public holidays and a planning calendar for the next financial year. Each planner is supplied with a pen kit including double-ended pen, stickers and brackets. BEST SELLER. 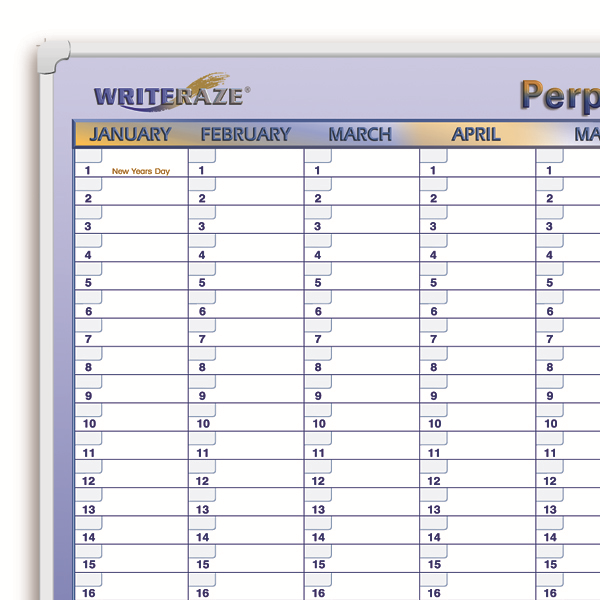 The most popular Year Planner on the market! Write-on wipe-off surface creates the perfect planner for your everyday needs. Includes past, present, future years, school terms and public holidays. Each planner is supplied with a pen kit including double-sided pen (black & red), stickers and brackets. This whiteboard is a multi-purpose laminated perpetual year planner. It has a dry erase surface, is fully mounted and framed on 4mm board and has an easy to use planning design. Change days, e.g. Monday, Tuesday, Wednesday and use year after year. Supplied with a quality dry erase market and mounting kit.